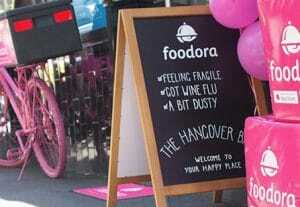 On Sunday 9th April, foodora and the hangover.clinic joined forces in a bid to help Sydneysiders rejuvenate to the max with a one-off and unique concept, the Hangover Bar. 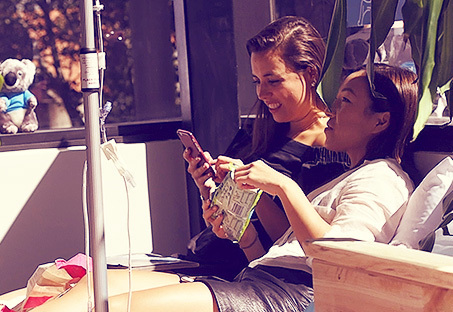 For one day only, guests had the chance to indulge in their favourite foodora eats, and experience one of the hangover.clinic’s many IV hydration treatments to refresh and rejuvenate! Polkadot PR invited top-tier lifestyle media and influencers to get amongst the action, held at the hangover.clinic in Surry Hills. The atmosphere was a hub of relaxation, and delicious food options from foodora, which included dishes from the likes of Saigon Lane, GUILT, Kawa Café and Beach Burrito, all washed down with vitamin-packed smoothies and juices supplied from Nudie. Other pampering treats included: private relaxation/snooze rooms, soothing foot and shoulder massages, Koala mattresses for afternoon naps plus, with TV partner Stan on board, we were set up for the day watching re-runs of Friends; feeling cosy and nostalgic. Guests who opted for the hangover.clinic treatments said goodbye to pounding headaches and queasy tummies with the IV treatments administered in the tranquil fully equipped Surry Hills clinic. All treatments were administered by fully qualified, licensed and insured doctors registered on the Register of Medical Practitioners, which lists all doctors currently authorised to practice medicine in Australia. Suffice to say, when we left we were feeling like totally new humans again! foodora is a global leader in food delivery phenomenon. 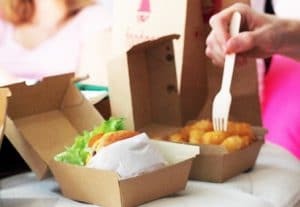 The company was launched in Germany in October 2014 with a mission to partner exclusively with high-quality restaurants which typically don’t deliver and revolutionise the food delivery experience. In less than two years, foodora has won hearts and stomachs, expanding to over 50 cities around the world and more than 7500 restaurants. In March 2016 foodora launched in Sydney, Melbourne & Brisbane.